Did Darden Restaurants Sell the Wrong Restaurant Chain? Red Lobster is no longer under Darden Restaurants. In competing with Bloomin' Brands, Brinker International, and several other restaurant companies, did Darden Restaurants think of everything when it sold Red Lobster? Or did it really sell the wrong restaurant chain? Darden Restaurants (NYSE:DRI) competes for the same customers who dine at several other nationwide casual-dining restaurant companies that include Bloomin' Brands (NASDAQ:BLMN) and Brinker International (NYSE:EAT), which are known for their Outback Steakhouse and Chili's Grill & Bar concepts, respectively. Last month, Darden Restaurants announced that it was finally selling Red Lobster to Golden Gate Capital for $2.1 billion . After tax and transaction costs, Darden Restaurants received almost $1.6 billion, which it plans to use for paying off outstanding debts and future share repurchases. Going forward, though, did Darden Restaurants sell the wrong restaurant chain? Darden Restaurants has foreshadowed for several quarters that it was going to make big changes regarding Red Lobster. Before the Red Lobster sale announcement last month, the company announced that it was ending the practice of having Olive Garden and Red Lobster combo locations. The idea revolved around both concepts sharing the same kitchen but having separate entrances and dining areas. Minus Red Lobster, Darden Restaurants still has a lot on its plate with Olive Garden, LongHorn Steakhouse, Bahama Breeze, Seasons 52, The Capital Grille, Eddie V's and Yard House comprising its remaining seven concepts. Total sales fell 1.1% last quarter while net earnings tumbled 18.5% for Darden Restaurants. By comparison, Bloomin' Brands saw its total revenue increase 6% to $1.2 billion as net income fell 15% to $53.7 million compared to the same quarter a year ago. Brinker International's revenue rose 2.1% to $758 million while net income rose 8.3% to $56.3 million in its latest quarter. Even though Bloomin' Brands came up short on net earnings, the company continued to outpace the casual-dining industry on sales and traffic. Likewise, Brinker International continues to see success with both its Chili's Grill & Bar and Maggiano's Little Italy concepts. Should Darden Restaurants have sold Olive Garden instead? First, let's look at the pros behind selling Red Lobster. Earlier this year it was reported that Americans are increasingly eating less seafood. In 2012, the average American ate 14.4 pounds of seafood, down from 15 pounds in 2011 and a record high of 16.6 pounds in 2004 . Shrimp prices, one of the biggest selling points at Red Lobster, continue to rise. In recent months, shrimp prices have jumped to a 14-year high. In March alone, shrimp prices surged 61% on a year-over-year basis. Even though seafood is considered one of the healthiest sources of protein, it just isn't popular right now with American appetites and continues to become more expensive in the process. Despite rising beef prices that rose 13% in April alone from a year earlier, steak remains a favorite in steakhouses. Darden Restaurants' LongHorn Steakhouse was one of 2013's leaders in the full-service steak dining category, with growth of 12.8% . Rounding out the benefits of dropping Red Lobster is the fact that it has been the weakest link in Darden Restaurants' portfolio for years. Comp sales fell 8.8% last quarter for Red Lobster, considerably lagging the last decade at -0.8%. However, there is a case to be made for selling Olive Garden instead of Red Lobster. Olive Garden has seen its comp sales fall significantly in recent quarters as well. Last quarter, the restaurant saw a 5.4% decline. There is also an issue with the overwhelming competition in the Italian restaurant sub-segment when compared to the seafood sub-segment. Ingredients and commodity costs make it much easier to open up an Italian restaurant than it is to make the logistics work to create a profitable seafood restaurant. Not only does Olive Garden compete with the thousands of mom & pop Italian restaurants, Bloomin' Brands and Brinker International have Carrabba's Italian Grill and Maggiano's Little Italy, respectively. Carrabba's Italian Grill recently added over 15 new menu items for $15 or less. In contrast, on its latest conference call, Darden Restaurants announced new price points at Olive Garden that would go up to $18.99 for lunch. Additionally, Maggiano's Little Italy has seen 17 straight quarters of comp-sales increases. The next question that needs to be asked is whether selling the company's second-largest contributor of revenue annually in Red Lobster for $2.6 billion solves anything. Darden Restaurants still has a big problem with too many restaurants under one roof and is still trying to fix its biggest contributor of annual revenue -- Olive Garden. 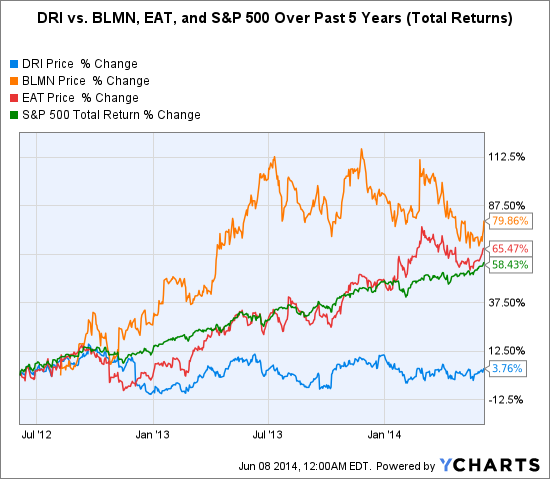 Lastly, Red Lobster was actually improving in the months leading up to its sale. Traffic improved in both March and April while comp sales fell the least in April since the fourth quarter of 2013 . Darden Restaurants will release its fourth-quarter earnings on June 20. Olive Garden's performance should be the focus of the earnings as Darden Restaurants announced renovations for the chain earlier this year. Online ordering was planned for nationwide completion for Olive Garden by August. LongHorn Steakhouse is also supposed to be in a testing phase with web-based reservations. After lagging both Bloomin' Brands and Brinker International for the past five years in total share price returns, any news that could move the stock price up is good news. The restaurant industry forecasts a record 2014 with $683.4 billion in sales. However, as competition throughout the restaurant industry has resulted in casual dining being squeezed out by the popularity of fast food and fast-casual dining options, will Darden Restaurants find its place again after selling Red Lobster? Or did the company sell the wrong restaurant?